Feb. and March Sourdough Workshops….. I am looking forward to a new year of workshops, starting soon with sourdough. Already the Feb. sourdough workshop is full. For my March sourdough workshop go straight to the booking sheet for dates and to add your email address. Click here for more info. on my sourdough workshops. Why not organise a sourdough workshops for your birthday (or other special celebration), or for someone else’s? I am happy to fit in with your required dates. You arrange 7 people to come, and the birthday person (8th) comes for free! Making of French style cultured butter will be included in the February sourdough workshop and future workshops, as long as local Two Cow or Ashgrove cream are available in the 2 litre size. Makes the most amazing butter. A special treat . Fresh supplies are flooding in from organic farmers and makers in Tasmania and the rest of Australia to fill my shelves with the freshest possible ingredients. You will never have to check dates on my supplies as I am more passionate about using freshly milled and made ingredients than you are! By request means that you are welcome to ring me or send me an email to arrange an alternative time to suit you. Everyone wants to be healthy. My mother is 92 and has been going to the same market for 90 years. She has no ailments at all. I recently went with her, when I was in Adelaide, and could hardly keep up! My brother and niece came too…. 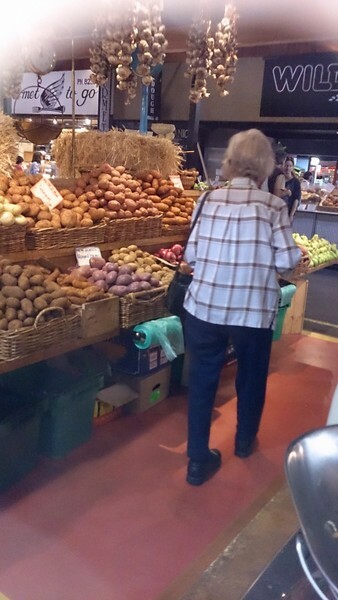 3 generations shopping at the same market; nice. 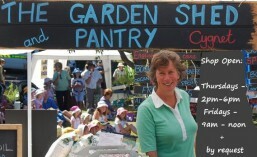 Here she is in this photo, buying organic and local produce only (she has all the answers for why you MUST!) from the Adelaide Central Market. If you go to the trouble of growing, buying, cooking and eating fresh, organic food, why on earth would you then go and eat grains, flours, nuts and seeds that are not fresh? It all comes down to advertising. It is impossible for supermarkets to have freshly milled goods and fresh nuts and seeds on their shelves so they concentrate on advertising fresh fruit and vegetables and hope you don’t care about the.rest. I only sell flours that are freshly milled. You can be assured that I am not popular with my suppliers for my refusal to accept goods milled months beforehand! I also only sell fresh nuts and seeds and am constantly ordering small amounts to ensure that my customers and I are eating the freshest ingredients possible. In the third century B.C., rotary grindstones powered by animals, and small rotary hand mills called querns, replaced stone or wooden mortars and pestles for the grinding of grains. Querns are still used in rural areas of the Middle East, Far East, and parts of Africa. There are several advantages to stone-ground flour. The endosperm, bran, and germ remain in their natural, original proportions. Because the stones grind slowly, the germ is not exposed to excessive temperatures. Heat causes the fat from the germ portion to oxidize and become rancid and much of the vitamins to be destroyed. Rancidity is carcinogenic.This is one reason that I do not use a vitamix or thermomix, which cut rather than grind the grain and do so at high speed which causes heat. A very sophisticated process is employed for the commercial milling of grain these days. Cleaning is accomplished by means of separators, aspirators, scourers, magnets, and washer-stones. The grain is tempered or conditioned in water to toughen the bran to reduce fragmentation when it is removed, and to obtain a moisture content resulting in particles of the desired size. During the milling process, steel rollers crush the grain, and the flour released from the endosperm is separated by sifters into different grades or streams, according to fineness. Each of these has different mineral and protein contents, and may be recombined later to form a variety of flours to be sold for diverse baking purposes. The bran and germ, which make up about 28% of the grain, are totally removed in this process. They are used in the production of animal feeds as -well as by pharmaceutical laboratories for making diet supplements. For approximately 20 nutrients, there is an average loss of 70-80% in refined and enriched flour. Its consumption clearly places the body at a disadvantage, casting a burden on the rest of the diet. Another concern with commercial flour is the possibility that it has been irradiated, which may cause more nutrient losses, the formation of radiolytes, and radioactivity in the food itself. Irradiated grains will not sprout and are devoid of life. The flours I sell have had none of this processing. They are simply produced by stone-grinding of organic, non-irradiated grains. The 85% light wheat flour and the sifted spelt flour are then simply sifted to remove some of the coarsest bran. Only whole grain, stone-ground flour is sure to contain the grain components in their original proportions and to include the germ. The way the stones grind distributes the germ oil evenly and without exposing it to excess heat, so rancidity does not develop as quickly as it would were it ground by steel roller-mills. Also, most research recommends storing freshly ground flour for no longer than two weeks, because rancidity becomes evident, and many flour components undergo chemical changes, when exposed to oxygen, increased humidity, high temperature, and light, and decreasing their availability to the body. After several months rancidity has caused carcinogenic amounts of rancidity, no matter how well the flour is stored and a reduction of some nutrients of up to 80%. If you would like to mill your own grains I have access to 2 mills; one a manual, stone mill, with a drill attachment option, the other electric but not a stone mill. You can read about them here. Let me know if you would like to order one and I will get the best price I can for you. I have a hand one which I use to coarsely mill oats for my breakfast. Mix all together, shape into flat burgers and fry. Assemble into rolls with mayo, lettuce, tomato and barbecue sauce. You can always find up-date (mostly!!) GaSP products and prices on the products page of the website.